Hooghly district, with its headquarters located at Chinsurah town, is within the Bardhaman Division of West Bengal. The name "Hooghly" (or Hugli) is derived probably from the `Hogla`, a tall reed, which grows in abundance on the riverbanks and in the marshy lowlands. A fertile, low-lying alluvial tract, the district is bounded by Bardhaman in the north, river Hooghly (Bhagirathi) on the east and by Bankura and Medinipur on the north-west and south-west respectively. The Damodar, Dwarakeswar and Rupnarayan are the other important rivers in the district. The earliest inhabitants of this region were tribes of fishermen and boatmen, a fact borne out by the predominance of the Kaibarta and Bagdi castes in the district today. In ancient times, this region was probably a part of the Suhma Kingdom, mentioned in the great Indian epic, Mahabharata. (In later eras, the name Suhma became synonymous with southern Rarh.) By the 3rd century B.C.E, the territory was annexed to the vast Mauryan empire and over the next 1600 years, it was occupied by a succession of various rulers including the Guptas, king Shasanka of Gour, emperor Harshavardhan, the rulers of the Ganga dynasty of Kalinga and the Sena kings of Bengal until it eventually fell to Muslim rule at the end of the 13th century. It was during Muslim rule that the port town of Satgaon (Saptagram) came into prominence. It became the seat of the local Muslim governors and sea trade flourished. The maritime activity at this time finds mention in medieval Bengali literature. The various versions of the Manasha Mangal Kavya, written around the late 15th century, all speak of a seafaring merchant, Chand Sadagar, who had sailed to Saptagram. Between 1520 and 1540, the great Vaisnav saint and disciple of Sri Chaitanya, Nityananda lived in Saptagram. Saptagram is now in ruins but the survival of the traditional boat-making centre at neighbouring Balagarh is reminiscent of the once thriving riverine trade. The 16th century saw the beginning of European settlements on the banks of the Hooghly. For the next few centuries, the district witnessed the rise and fall of European powers battling for monopoly in trade and power. The Portuguese were the first to arrive in Bengal in 1535. They began trade at Satgaon and in 1575, with the permission of the Mughal emperor Akbar, they established a settlement at nearby Hooghly. With the silting of the Saraswati river, on whose banks Satgaon stood, trade here declined and by the late 16th century CE, Hooghly had supplanted Satgaon as the more important commercial centre. By the end of the century, both port towns were mainly occupied by the Portuguese (Firinghees), with Hooghly (Ogouli, Ugolim), being in the sole possession of the settlers. The end of the 16th century also saw many Portuguese degenerate into pirates and slave dealers. This incurred the wrath of Emperor Shah Jahan, who laid siege on the settlers in 1632 and carried off thousands of prisoners. However, the Christians among the prisoners were allowed to return to Bengal and settle at Bandel, near Hooghly. But the Portuguese could not regain the monopoly in commerce that they had enjoyed so far. There was now competition from the Dutch (who had already settled at Chinsurah) and later the British. In the first half of the 18th century arrived the French, Danes, Prussians and the Flemish – most of whom settled and built kothees (factories) along the banks of the Hooghly. The French settlement was at Chandernagore (Chandannagar) which remained under their control from 1696 till 1950 while the Danish settled at Serampur (Srirampur), which they called Frederiksnagore, between 1755 and 1845. The Portuguese legacy however remains, not only in the Bandel church they rebuilt in 1660, but also in their language. Many Portuguese words like chabi, balti, perek, alpin have come into the Bengali vocabulary. The British East India Company built their first factory at Hooghly in 1651 and settled here, but increasing hostilities with the Nawab eventually led them, under Job Charnock, to abandon the town and move downriver to Sutanuti in 1686. The district (as part of the Bardhaman zamindari) along with other Bengal zamindaris was finally ceded to the British by the Nawab of Bengal Mir Kasim in 1760, after the Battle of Plassey. 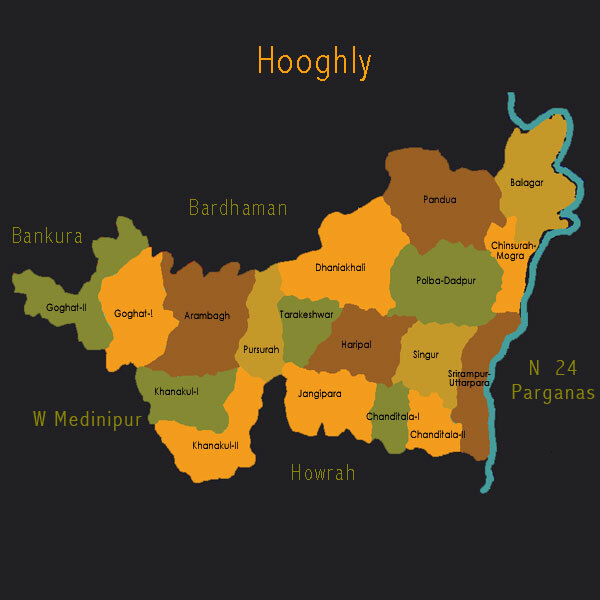 In 1795, for administrative purposes, Hooghly district was detached from Bardhaman division and given separate magisterial charge and in 1822, the Hooghly collectorate was separated from Bardhaman. In 1843, Howrah district, which till now was under Hooghly’s judicial control, was separated from Hooghly. As a result of European presence, urban conditions prevailed along the right bank of the Hooghly from very early on, while the rural hinterland has long been famous for its fertility. Agricultural progress and industrial development have made Hooghly one of the most prosperous and economically developed districts of West Bengal after independence. About 70% of the population derives their living from the agriculture while at the same time, the district is an important industrial hub of West Bengal. Against a backdrop of burgeoning urbanization, the district is home to farmers, weavers, boat makers, craftsmen and artisans. Fishing too is an important industry here. Among the textile-based crafts that have been prevalent in the district for many centuries are wooden block printing on cotton and silk at Srirampur and chikon embroidery. There is a rich tradition of weaving handloom cotton textiles in Hooghly with Dhaniakhali, Srirampur, Antpur, Haripal, Begumpur and Farasdanga (another name for Chandannagar) being important centres. According to the Census of 2011, Hooghly district has a total population of 58,41,515; 68.81% of which lives in the rural areas. A major portion of this population is the result of migration. With a history of colonial rule, education has been part of the cultural ethos of this district. This is reflected in the high literacy rate of the district. In fact, literacy among the Scheduled Castes (59.04 %) is more than the state average. Hooghly is the birth-place of Sri Ramakrishna and Raja Rammohan Roy and the primary working place of Ishwarchandra Vidyasagar and Rev. William Carey, who established the first printing press in the 19th century here. The famous Bengali writer, Sarat Chandra Chatterjee, Ramnidhi Gupta alias Nidhi Babu and the Kobial, Anthony Firinghee were also born here. The tribal population, the bulk of whose ancestors were immigrants, celebrate their various festivals with their colourful and rhythmic songs and dances. Folk performing arts are rare among the non-tribals in Hooghly. A few performers struggle to keep the near extinct Leto folk drama form alive. There are, however, many religious festivals that are celebrated in the district – Jagaddhatri Puja and the over 600-year-old Rathajatra (chariot festival of Lord Jagannath) of Mahesh, being the most famous. Probably due to the ravages of rivers and perhaps the iconoclastic zeal of the Muslim rulers, Hindu relics are few in number and not of any great age. Recent remains include the Shiva temple at Tarakeswar and the Sakta temple of Hansheswari at Bansberia. Among other places of interest are the 19th century Imambara built by Haji Mohammad Mohsin, the 14th century mosque at Furfurah Sharif, the remnants of the Fort Gustavus Church in the Dutch settlement at Chinsurah, the Bandel church of the Portuguese, and of course the French city of Chandannagar, for its architecture.